Caramel Pudding. Put 3 half pints of milk on to boil with enough sugar to sweeten it, & a small piece of lemon peel. While the milk is boiling, put 2 or 3 oz. 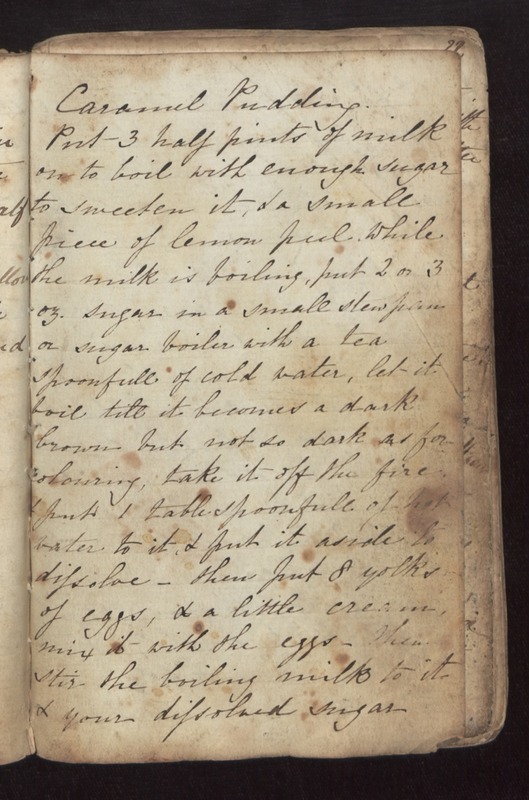 sugar in a small stew pan or sugar boiler with a tea spoonfull of cold water, let it boil till it becomes a dark brown but not so dark as for colouring; take it off the fire, & put 1 tablespoonfull of hot water to it, & put it aside to dissolve - then put 8 yolks of eggs, & a little cream, mix it with the eggs - Then stir the boiling milk to it & your dissolved sugar.